Is biking fun? Did I enjoy myself? Maybe and not really. I don't get people who bike for fun. I began bike commuting as a fresh-faced WW intern. Powered only by the pizza my roommate brought home from work and my dreams of being a lauded journalist, I launched myself from a punk house in Woodstock to our offices off of 23rd simply because it was the most cost-effective way of getting around. Some five years later, my circumstances have changed. Now a gray-faced civil servant, I can afford to live with only one roommate and buy groceries at Winco. I no longer seek fame and fortune; most of my dreams now revolve around having enough money to buy the combined works of Steely Dan and William T. Vollmann, and enough time to indulge in them. But I still bike commute. It remains the most cost effective way of getting around, and while demonstrably less poor, I'm still far from wealthy. It is perhaps this economic aspect that so baffles me about leisure riders. Did they not get the memo that cycling is supposed to be cheap and practical? Then again, perhaps there is something I don't understand. Maybe cycling really is fun, and my relegation of it to an austerity measure has blinded me to this truth. I aimed to find out. 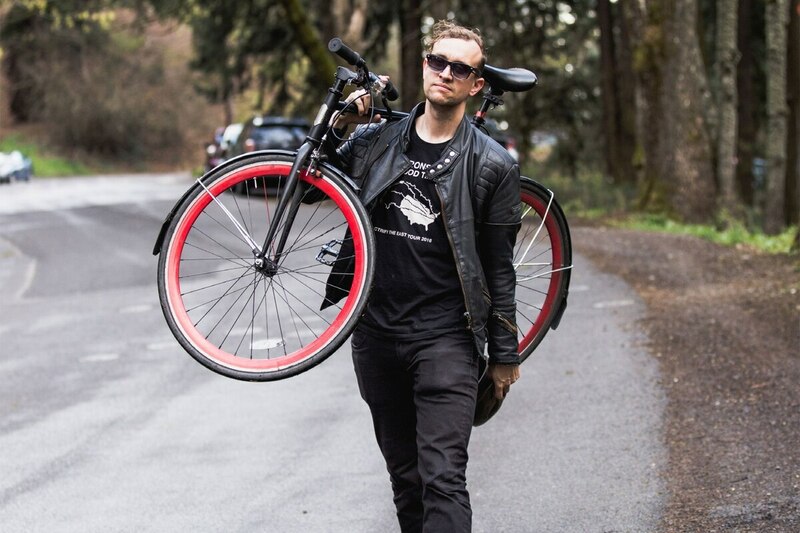 Equipped with only my Pure Fix single-speed—the cheapest bike 7 Corners Cycles sells—jeans, a T-shirt, and my German army coat—the cheapest Gore-Tex coat that Andy and Bax sells—I journeyed out to four popular Portland bike rides to try and have a good time. It had been a rough week at work so, naturally, I decided to bike to Boring. I was feeling powerless, I was feeling pissed, I was feeling like biking for 40 miles. I entered the Springwater Corridor Trail just off Southeast Division Place. And then I kept going. And going. The trail itself is relatively flat, and the foliage is of the ever-appealing highway-median variety. At one point, I saw a woman riding a horse. I began to question the wisdom of riding in my jeans when it began to rain on my way home, but luckily, the trail cuts through Cartlandia on 82nd, and I was able to dry off with a burrito and a beer. I got a flat in Sellwood, which is a fitting reminder that if you're planning on biking for 40 miles, you should probably bring a spare tire. The next time I need to blow off some steam, that's exactly what I'm going to do. On a sunny, spring afternoon, I attempted to change my tire in Mount Tabor Park—and, in the process, skinnned my knuckles and yelled obscenities at inanimate objects. Filled with triumph and covered in grease, I eventually wrested my wheel back onto my frame and set forth from Mount Tabor—only to have it pop immediately after I exited the park. Defeated, I turned my bike over to the professionals, namely Ruthie at Mount Tabor Cycle and Skate, who found a chunk of metal lodged in my tire. Once on my way, the ride was relatively straightforward. Signs clearly mark the route. The bike lanes east of 82nd, though wide, are distinctly of the "filled with rocks and glass" variety, so you'll want to bike carefully. Finally, keep in mind that some of the trails leading up to and on Powell Butte are gravel, so if you are one of those people who has multiple bikes and/or tires, you'll want to use something heartier for this endeavor. North Portland is baffling to me, in part because there are no numbered streets in it, and in part because I spent no time in it as a teen because I was told it was dangerous. Whatever the reason, whenever I journey west of Vancouver on the peninsula, I get lost. This ride was no exception. I did begin at Peninsula Park, get to Kelley Point and return to Peninsula Park. Apparently, the ride out to Kelley Point along the Slough Trail is supposed to be scenic, largely car-free and mostly flat. Instead, I ended up huffing 18-wheeler fumes for a large portion of my ride, missed a turn onto the Slough Trail and ended up on North Schmeer Road instead, where I almost get schmeered into the road by a late-model Camry. Thanks to a combination of diet and exercise, I'm happy to report I'm in the best shape of my life. However, that shape is not good enough to propel me up to Council Crest on a single-speed bike. About halfway up the hill, I recalled that my pay per hour on this assignment fell well below minimum wage, and that, as this was a newspaper article and not high school football practice, there was no middle-aged, pot-bellied bald man yelling at me about playing through the pain. I turned around and rode home. If you can do this ride on a single-speed then congratulations, you're in better shape than I am.